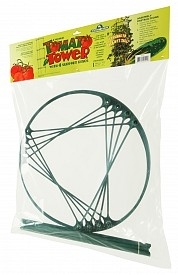 The 4' Tomato Tower with support rings is a versatile garden accessory. This tomato cage was designed to fit in our Tomato Barrel (shown in photo...not included), but it works just as well as a stand-alone plant cage that can be used in your garden. It allows the flexibility of adding only the number or rings you need as your plants grow. Can also be used in aquaponic grow beds to support larger fruiting plants. Add support rings as needed.